Formed deep within the earth, stronger than steel, and thinner than a human hair. These comparisons aren't describing a new super hero. They're describing graphene, a substance that some experts have called "the most amazing and versatile" known to mankind. UConn chemistry professor Doug Adamson, a member of the Polymer Program in UConn's Institute of Materials Science, has patented a one-of-a-kind process for exfoliating this wonder material in its pure (unoxidized) form, as well as manufacturing innovative graphene nanocomposites that have potential uses in a variety of applications. Because of these unique qualities, graphene has been a hot topic for academic researchers and industry leaders since it was first isolated from graphite in 2004. Since then, more than 10,000 scholarly articles have been published about the material. But of these publications, only Adamson's discusses a proprietary process for manufacturing graphene in its pristine form. What others are calling "graphene" is often actually graphene oxide that has been chemically or thermally reduced. The oxygen in graphene oxide provides a sort of chemical handle that makes the graphene easier to work with, but adding it to pristine graphene reduces the material's mechanical, thermal, and electrical properties in comparison to unmodified graphene like the kind Adamson produces. It also significantly increases the cost to manufacture the material. Oxidizing graphite requires adding expensive hazardous chemicals, such as anhydrous sulfuric acid and potassium peroxide, followed by a lengthy series of manipulations to isolate and purify the products, known as a chemistry workup. Adamson's process doesn't require any additional steps or chemicals to produce graphene in its pristine form. "The innovation and technology behind our material is our ability to use a thermodynamically driven approach to un-stack graphite into its constituent graphene sheets, and then arrange those sheets into a continuous, electrically conductive, three-dimensional structure" says Adamson. "The simplicity of our approach is in stark contrast to current techniques used to exfoliate graphite that rely on aggressive oxidation or high-energy mixing or sonication – the application of sound energy to separate particles — for extended periods of time. As straightforward as our process is, no one else had reported it. We proved it works." Soon after the initial experiments by graduate student Steve Woltornist indicated that something special was happening, Adamson was joined by longtime collaborator Andrey Dobrynin from the University of Akron, who has helped to understand the thermodynamics that drive the exfoliation. Their work has been published in the American Chemical Society's peer-reviewed journal ACS Nano. A distinctive feature of graphene that seems like an obstacle to many – its insolubility — is at the heart of Adamson's discovery. Since it doesn't dissolve in liquids, Adamson and his team place graphite at the interface of water and oil, where the graphene sheets spontaneously spread to cover the interface and lower the energy of the system. The graphene sheets are trapped at the interface as individual, overlapping sheets, and can subsequently be locked in place using a cross-linked polymer or plastic. 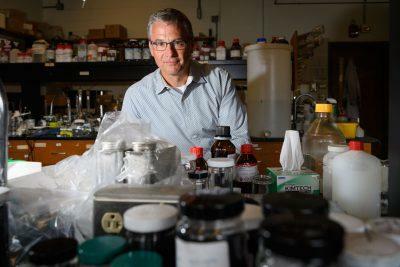 Adamson began exploring ways to exfoliate graphene from graphite in 2010 with a grant from the Air Force to synthesize thermally conductive composites. This was followed in 2012 with funding from a National Science Foundation (NSF) Early-concept Grants for Exploratory Research (EAGER) award. Since then he has also been awarded a $1.2 million grant from the NSF Designing Materials to Revolutionize and Engineer our Future program and $50,000 from UConn's SPARK Technology Commercialization Fund program. "Dr. Adamson's work speaks not only to the preeminence of UConn's faculty, but also to the potential real-world applications of their research," says Radenka Maric, vice president for research at UConn and UConn Health. "The University is committed to programs like SPARK that enable faculty to think about the broader impact of their work and create products or services that will benefit society and the state's economy." "The product we are developing will be an inexpensive graphene material, with optimized performance as an electrode, that will be able to displace more expensive, less efficient materials currently used in CDI," says Michael Reeve, one of Adamson's partners and a veteran of various successful startups. The team formed a startup called 2D Material Technologies, and they have applied for a Small Business Innovation Research grant to continue to commercialize Adamson's technology. Eventually, they hope to join UConn's Technology Incubation Program to advance their concept to market. Adamson, together with collaborators Andrey Dobrynin of the University of Akron and Hannes Schniepp of the College of William and Mary, previously conducted research that sparked the idea for this invention through support from the National Science Foundation as part of the Designing Materials to Revolutionize and Engineer our Future initiative: DMR1535412. This NSF program supports the federal government's Materials Genome Initiative for Global Competitiveness. However, no resources from this previous award were used to fund product development or testing of the current prototype device.